What Makes a Presidential Résumé? Most commonly? Practicing law and serving in the military. Least commonly? Tailoring and cattle ranching. Nineteen former members of the American workforce are running for president—including a pastor, a horseshoer, and a documentary filmmaker. Throughout history, many presidents have arrived at the White House via a well-worn career path: an undergraduate degree, years practicing law, and any number of terms as a governor, senator, or representative. The 2016 slate is no different, with nine former lawyers, 10 governors, and a smattering of undergraduate and postgraduate degrees. But some candidates have taken the road-less-traveled to their presidential bid. 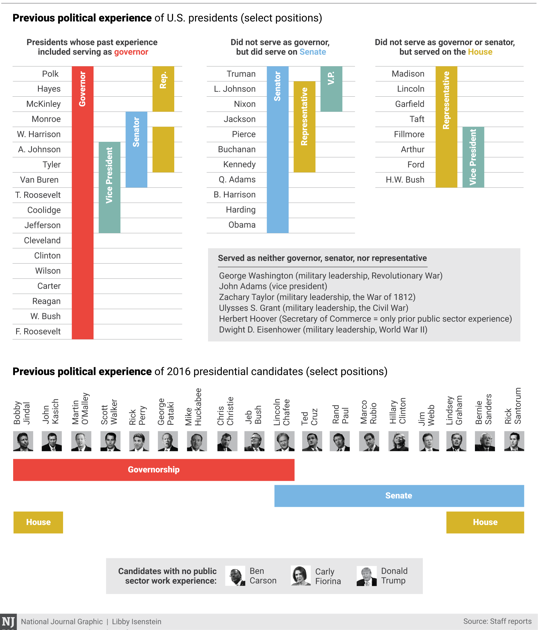 The three charts below explore the backgrounds of 2016 hopefuls and map just how their experiences match (or diverge from) those of past presidents. 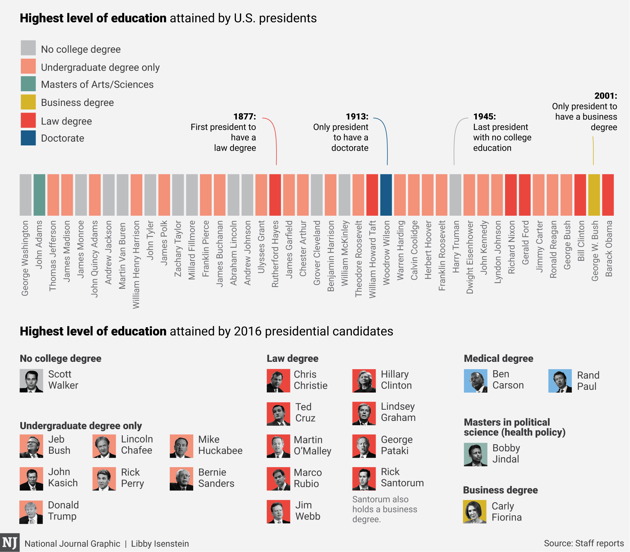 Although every president in the last seven decades had a college degree, it wasn't always that way. A total of 12 commanders in chief made it to the White House with no college degree at all. Scott Walker is the only likely 2016 candidate who has not completed any college program. Twenty-six presidents practiced law before landing in the White House, but only six actually held law degrees—before the late 19th century, such degrees did not exist. All but three of the 2016 candidates have experience in politics. Where government jobs are concerned, a president's most common previous gigs are serving as a governor, senator, representative, or vice president. Only five men have served as commander in chief without first filling one of those roles. 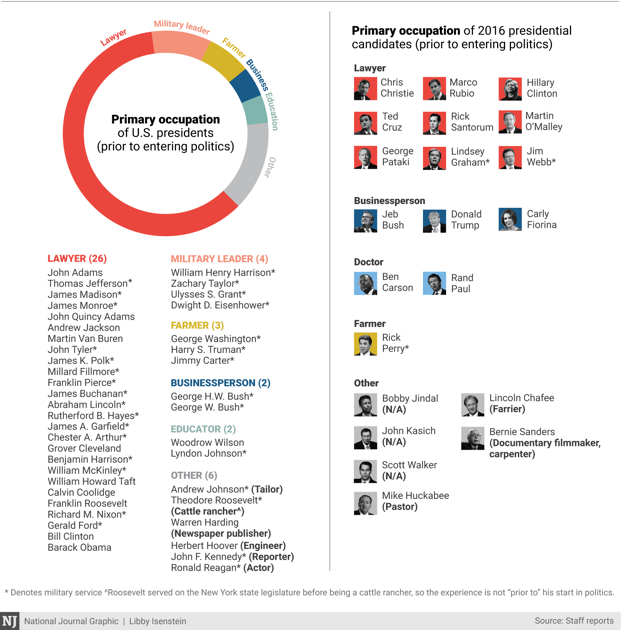 The most common pre-politics career among U.S. presidents is law, by a wide margin. Unsurprisingly, almost half of the 2016 candidates practiced law at some point in their early careers. But a few candidates have more colorful CVs. Bernie Sanders spent some of his early years producing educational films and was most known for his short documentary on American union leader Eugene Debs. Lincoln Chafee worked seven years as a farrier, shoeing horses at racetracks throughout the U.S. and Canada. Mike Huckabee was a Baptist pastor before eventually becoming governor of Arkansas. Ben Carson and Rand Paul are not the first doctors to enter the presidential race, but the U.S. has yet to see a president with an M.D.